I was dumped out on a country road in Lawrence County, Ohio. I am too young to know how to fend for myself. I was so scared and hungry that when I saw cars and trucks coming, I would try to get them to stop so they could take me home. My only problem was that I could not hear them coming because I am deaf! One day a man saw me, took me home with him and fed me, but he would not let me in his house. So back to the road I went to see if I could get a ride back home. That’s when my luck ran out. I was hit by a car! The car did not stop, and I laid by the road aching in pain. A few days passed, and the man showed up again. This time he gave me food, but he left me lying by the road. I laid there for a few more days, then I decided I had to try to go find some food and water. I struggled to my feet and, dragging my broken front leg, I walked for what seemed like months. When I finally made it back to the man’s house, he said I had been missing for two weeks. I laid at his house in pain for a few more days, but at least I had food and water. Finally one day he loaded me into the car and took me to the vet. The vet X-rayed my leg and said that I have a broken humerus (the short bone between the elbow and shoulder). The vet told the man that it would cost $2000 to fix it. The man said that he could not afford to have it fixed, and because I was stupid enough to walk out in front of a car, I could live with it! Finally the man decided that he really did not want me. Even though I was such a sweet dog, I was too much trouble. 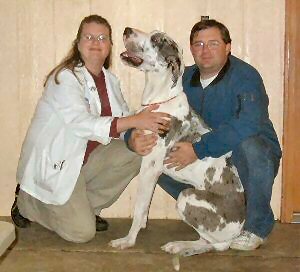 He contacted a Great Dane Rescue in West Virginia, but since I was in Ohio, they could not help. However, they did contact HHGDR to see if they would take me. They said they would, and the man made arrangements to take me there he next Sunday morning. Sunday morning came and went, and we did not leave like he had promised. I heard him on the phone saying that it would be next week or later because he could not make it to HHGDR before then. I had thought I was finally going to get the medical attention I needed, but I was wrong! A few days later a nice woman and her husband showed up and loaded me into their car. The man gave them my X-rays, and off we went. At first I was frightened, but the nice woman told me not to worry because I was on my way to HHGDR, and I would be getting medical help real soon. I arrived at the Rescue on October 16, 2003, and everyone made a fuss over me. They told me that I would go to the vet the very next day. I can hardly wait because I know they will fix my leg as good as new! The next morning after I arrived at the Rescue Grandma Dale helped me into the truck, and off we went to see Dr. Dan. When he looked at the X-rays that were taken shortly after I was hit and compared them with the one that he had just taken, he said it was a shame that he couldn’t have seen me then. That it would have been easy to repair the break then, but now that it had been six weeks since the break, he couldn’t do the surgery. The break had not healed in proper alignment, and the elbow was fused and would never move again. After a consultation with Dr. Steve (a specialist in bone surgery), it was determined that even if they rebroke the bone and realigned it, I would still have pain for the rest of my life. Grandma Dale was in tears when she told me that my leg would have to be amputated so I would not have to suffer in pain anymore. After that I don’t remember much. I do remember that Grandma Dale was beside me when I went to sleep, and she was still there when I woke up. They must have given me something because for the first time in a long time I didn’t have that awful pain in my leg. These pictures are GRAPHIC so if you have a weak stomach do not open!! Dr. Dan Meakin of All Creatures Animal Hospital and Judy Wilson. Grandma Dale stayed with me all night just holding me in her arms. When I would wake I would give her tons of kisses letting her know it was okay not to have my leg anymore because not having the pain was well worth it!! When it was time for her to get up and take care of the other dogs I gave her a big surprise I got up and followed her down the hall! It was scary at first but I am getting the hang of it really quickly. I even went outside to the bathroom all by myself and ate a big breakfast!! Today is the first day of the rest of my pain free life!! Well the drains are out of my incision and they say the sutures will be coming out soon. I will be glad as I am getting tired of wearing all of these clothes!! Thank you very much for helping to pay for my surgery!! Don't forget the other dogs at the rescue they need your help too!!! I am now ready for adoption!! I have not been in rescue for a full month but things have really changed for me. I am now a happy healthy puppy again!! I am looking for a family that has LOTS of love to give and wants to receive just as much!! I love being loved on and giving kisses. I love to follow the people I care about all around the house helping as much as they will let me. If you are looking for a very affectionate puppy then I may just be the right puppy for you!!!! All day everyone kept telling me it was going to be my special day. I did not understand but then it happened!!! My new mom and dad came to pick me up and take me to my forever home!!! I have a brother Floyd and a sister Dot both of whom were adopted from HHGDR. In less then 2 months I went from being in pain to being the happiest puppy in the whole world!!! Me and my proud NEW parents!! !